A good friend of mine from our local makerspace enjoys teaching students about electronics by taking stuff a part. He has a talent for finding free or inexpensive pieces that students enjoy deconstructing. Through this experience, he has the opportunity to connect the theory of electronics/mechanics to real stuff. Inspired by this teacher, I decided to try it myself. My sons bought a broken RC car from Good Will for $2.00. With the car in pieces, we started playing with the components to see if we could get anything working. With bread board and batteries, we found that the motors of the RC car were function. 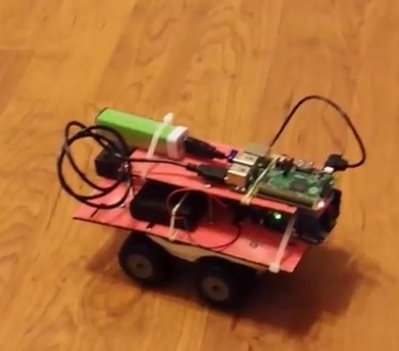 After an evening of hacking using an Arduino, a motor driver, a Raspberry Pi, and Wifi connector, we cobbled together a Raspberry Pi controlled robot. (see below) Not bad for $2.00 of source materials. So… I’d like to offer a challenge for this month. 2. Take it apart, and figure out how to make something new from it. 3. We’d love to hear your stories of taking something broken and re-purposing it into something beautiful, fun or functional. Post your entries to Twitter, Instagram, Google+, or Facebook using the hashtag #RepurposedCraft. Thanks for sharing your work!!! Are you passionate about DIY, tinkering, and crafting? We would enjoy hearing what you want to make in 2016. Thanks for taking this quick survey.